WIRED Magazine and LivingHomes, pioneers in green, prefabricated development, had partnered to create a modern home that showcased the latest in eco-design while striving for a gold rating in the process. 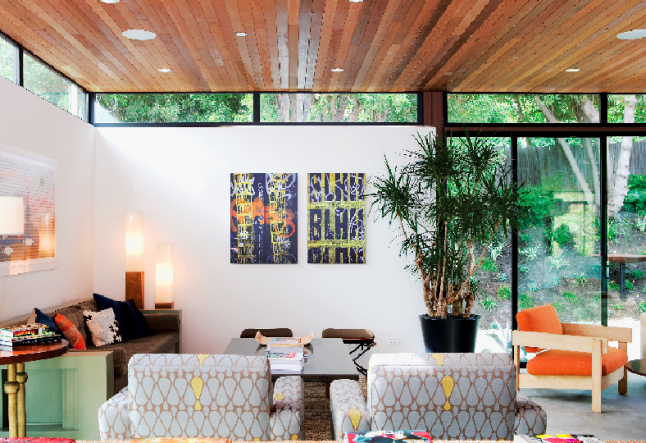 Designed by Ray Kappe, a Los Angeles-based architect internationally recognized for his modernist aesthetic and eye to nature, this 4,057 square foot house is the paragon example of how form and function can be leveraged against value and price while showcasing the latest methods of reuse and renovation. Consistent with its focus on sustainable design, the WIRED LivingHomes project deconstructed rather than demolished the property’s existing structure, enabling them to reduce the amount of building materials sent to landfill. By working with The Reuse People, a nonprofit corporation dedicated to fulfilling reuse solutions, they were able to transport framing from the existing house to Mexico where it will be used for low-income construction as well as donate interior materials to Habitat for Humanity. Nearly seventy-five percent of its existing materials will be reused or repurposed. Licensed demolition contractors are trained to recognize the “embodied energy” of building materials and will salvage elements such as glass, doors, wood siding and windows, and assure their distribution for reuse elsewhere. About thirty to forty percent of a traditional home once demolished, will end up in a landfill. Compare this to the two to three percent for a prefabricated home and the benefits for sustainable development are indisputable. With windows made of recycled glass that embrace the surrounding landscape, coal and fly-ash concrete floors to swallow your step and reclaimed redwood to adorn the ceilings and provide for exterior cladding, the features of this home are not only environmentally-responsible but they are visually captivating as well. All aspects of this WIRED LivingHome were designed to attain at least a Gold rating from the United States Green Building Council’s (USGBC) LEED® for Homes Program. The Lego example of home construction is a simple concept but demands high standards and advanced planning. The Leadership in Energy and Environmental Design (LEED) Rating System™ is the nationally accepted benchmark for green design, construction and operation and promotes a whole-building approach to sustainability by recognizing performance in five key areas of human and environmental health that include sustainable site development, water savings, energy efficiency, materials selection and indoor environmental quality. For this model, LivingHomes used steel for structural support, soy-based materials for insulation, FSC certified wood for function and décor (Forest Stewardship Council certifies wood that is culled from a certified, well-managed forest) and the most efficient appliances on the market, showcasing the possibility of creating a living space that respects and nurtures our environment. One of the most frequented spaces of any home is the kitchen. Idle appliances in this room make up for a large portion of a home’s energy bill. WIRED LivingHomes spared no expense in ensuring this house would maintain the highest-level of energy efficiency. In addition to using solar panels for power, tankless water heaters, radiant heating and cooling systems and LED lights (which consume far less energy than conventional bulbs) throughout the entire house, upgrades were also made to major appliances. By incorporating the most environmentally friendly refrigerators and washer/dryers on the market, the future owners of this house will enjoy a thirty-six percent increase in overall efficiency than a conventional home of a similar size. High-tech yields low impact and this means more money in the pocketbook without the sacrifice of function or design. Framed mostly in recycled glass, this modern abode blurs the line between outside and inside living spaces with unobstructed views across different rooms of the house. Here, the garden becomes a canvass for afternoon daydreams and the living room effectively becomes a canopy of sky. A two-story open atrium welcomes visitors to the home and the entire second floor is cradled in deck space where the most high-end, sustainable furnishings can be admired directly among nature. 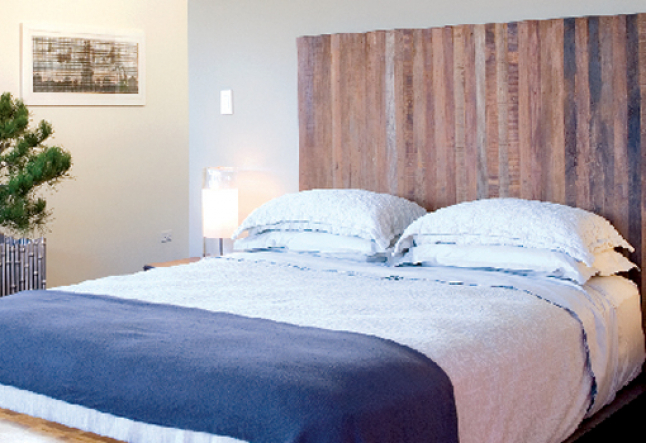 The bathroom countertops are also fashioned out of recycled glass, ecological kitchen cabinetry is used in the one room we all use the most, even the headboard in the master bedroom is a beautiful, rustic example of how high-design and respect for the earth can go hand in hand. Perhaps one of the most impressive elements of the home’s design involves the different woods used to complete the indoor paneling, ceilings and exterior. Using the most durable products manufactured in the most environmentally responsible way, this home features recycled redwood milled from deconstructed military barracks as well as redwood recycled from an old bridge as well as from an architect’s house. Using the concept of “everything in its place,” all that is required from us is that we extend a commitment to work with an existing environment rather than exploiting it. The benefit to us all comes by way of healthier homes that leave a dramatically smaller, ecological footprint. This prefab home proves that stunning design and a respect for the environment can and do go hand in hand. * About 30% to 40% of a traditional home once demolished, will end up in a landfill. Compare this to the two to three percent for a prefabricated home and the benefits for sustainable development are indisputable.